If Google's Chrome browser is freezing on you after you install the Windows 10 April 2018 Update, you'll be please to know that Microsoft is on the case. On its community message board, the Redmond company acknowledged that it's ”aware that some devices running the Windows 10 April 2018 Update (version 1803) may hang or freeze when using certain apps, such as ‘Hey Cortana’ or Chrome.” Microsoft says it's working on a solution, and aims to include the fix in the next regular Windows 10 monthly update, which is due on May 8. In the meantime, though, a Microsoft spokesperson has suggested that users experiencing freezing should try inputting the following Windows key shortcut to wake the screen: Windows logo key + Ctrl + Shift + B. Those on Windows tablets without a keyboard can trigger the same command by simultaneously pressing both the volume-up and volume-down buttons three times for two seconds. 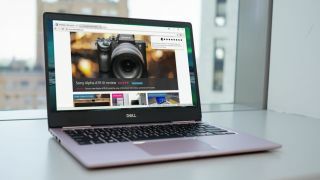 If this solution works, users should hear a short beep and see their screen blink or dim while Windows attempts to refresh the display on their device. Alternatively, laptop owners can close and open their laptop screen. If all else fails, users may have to force-shutdown and restart their device, but this may unfortunately lead to some loss of data. For all other Windows 10 April Update problems, we have a thorough troubleshooting guide for you. Don’t have the Windows 10 April Update yet? Here’s how to download it right now.